It feels like the casino games by Leander have been around forever, but that certainly isn’t the case. This brand wasn’t created until 2008, while it took even longer for their product to reach many of the online casinos that we are familiar with! Unlike many other developers, like Netent, Quickspin, ELK, Thunderkick and Yggdrasil, Leander is not from Sweden, either. They are actually from Buenos Aires in Argentina, which is anything but a common origin for a casino software developer. But that doesn’t matter. What we care about is how impressive their games are, and in that sense, we definitely don’t have anything to complain. At this time, Leander hasn’t created too many games yet. There are only twelve different video slots that have been released so far and that is of course a pretty small number compared to what other developers can offer. But I’m sure you’ll agree that it isn’t all about quantity. What really matters is how fun and entertaining these games can be, and that is something that really sets Leander apart from the competition. Their bonus features are remarkably innovative, while they also look absolutely fantastic. It may make you think a bit of the video slots that were created by ELK and Thunderkick, although the Leander slots really do have a unique feel to them. Their current portfolio of games is limited to video slots and it consists of the following titles: Ave Caesar, Alice Cooper, Scrooge’s Jackpot, Wild Vegas, Apollo God of the Sun, 3 Elements, Cash Mix, Gustavo El Luchador, Candy Spins, Wild Jane the Lady Pirate, Golden Money Frog, and Shang Dynasty. As you can already tell from the names, their themes are all different, and that also goes for their respective bonus features. Not convinced? What if we told you that these slots have been translated into more than 30 languages, while they also support many different currencies? Go ahead, try one today! Before you ask any questions, let us put your thoughts at rest and assure you that the Leander casino games are completely reliable. Sure, they were not created by a company which was founded within the EU, but the same goes for some other famous developers, like IGT and WMS. And regardless of where they are originally from, they do have all of the necessary licenses from European institutions! 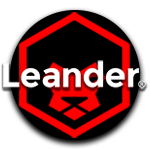 Leander has been accredited and licenced by UK and AGCC standards, which has made it possible for you to try their games at many different well-known online casinos. In some cases, developers might actually require you to download their games before you can play them for real money. That certainly isn’t the case when it comes to Leander. They offer their products both in HTML and Flash, meaning you can simply play them in your browser at your favourite online casino. And that isn’t all… This underlying technology also happens to be state of the art, meaning you can expect wonderful animations, top-notch graphics and fun features, without suffering any performance issues on your device. Oh, and speaking of devices, you can also play the Leander slots on mobile! That´s right, you can enjoy all of their games on your smartphone or on your tablet, in addition to your computer or your laptop! Their functionality has even earned them an EGR B2B award in 2013, which alone should tell you enough about the quality of their products.